Coffee Pot Reviews are short reviews that I write in the length of time it takes my coffee pot to brew.. I needed an Ilona Andrews fix and devoured the Kinsmen series. 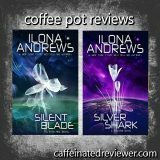 Grab a cup of coffee and check out my thoughts on Silent Blade & Silver Shark.